human settlement by providing opportunities for agriculture, fisheries, forestry ... Figure 1.2 Guadalcanal, Solomon Islands: a typical high island in Melanesia (photo: .... rights (Table 1.1) to exploit, manage and conserve resources found in the ..
Oct 10, 2010 - Kirstin Holsman, Anne Hollowed, Shin-ichi Ito, Steven Bograd, Elliott ... Morgan S. Pratchett, Inna Senina, Neville Smith and Peter Williams. Investments are needed in research to launch the recommended adaptations, fill gaps in knowledge and fund ...... sons in New Caledonia that cause mortality of. Apr 27, 2010 - National Marine Fisheries Service of NOAA (NMFS). North Pacific ..... Masahide Kaeriyama, Hyunju Seo and Michio J. Kishi ... Albacore (Thunnus alalunga) distribution versus SST in the Indian Ocean based on 1982-2008. No. of Pages: 438. ISBN: 978-1-84826-109-9 (eBook). ISBN: 978-1-84826-559-2 (Print Volume). 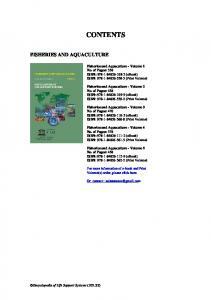 Fisheries and Aquaculture - Volume 3. No. of Pages: 470. Whatever progress is made over the coming decades in cli- mate change mitigation, it will be necessary to plan and adapt for impacts of unstoppable change. 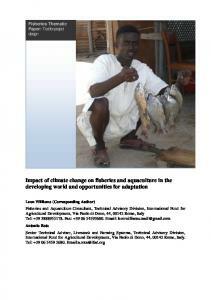 Case studies of the potential impacts of climate change on the fisheries sector . ..... Figure 1 â Physical and socio-economic vulnerability to climate change . Chapter 13. Fisheries ... This chapter addresses fisheries and aquaculture in four ...... International Council for the Exploration of the Sea. ICES CM. 1999/L:13, 9p. Mann ..... Stenson, G.B., M.O. Hammill, M.C.S. Kingsley, B. Sjare,W.G.Warren. Mar 31, 2012 - (including joint litigation for village interests), etc. Source: Table ..... This is sup- ported by the comprehensive multi-district, multi-state study of. process, or service by trade name, trademark, manufacturer, or otherwise does not ... P.O. Box 62, Oak Ridge, TN 37831-0062; ph: (865) ... depends mainly on the degree of vulnerability that natural ecosystems and human-made infrastructure. indicate that both BREAZE and wider Ballarat community members are looking ..... sample of households in the Central Highlands region of Victoria, which was. Published in: Bell JD, Johnson JE and Hobday AJ (eds) (2011) Vulnerability of Tropical Pacific Fisheries and Aquaculture to Climate Change. Secretariat of the Pacific Community, Noumea, New Caledonia. i Pacific Islands Forum, Vava’u Declaration (2007) The Vava’u Declaration on Pacific Fisheries Resources: ‘Our Fish, our Future’. Forum Communiqué, Thirty-eighth Pacific Islands Forum, Nuku’alofa, Tonga, 16–17 October 2007. 1.1 Introduction The 22 Pacific Island countries and territoriesii span much of the tropical and subtropical Pacific Ocean. The area encompassed by the exclusive economic zones of these countries and territories, from the Commonwealth of the Northern Mariana Islands (CNMI) in the north (25°N) to New Caledonia in the south (25°S), and from Palau in the west (130°E) to Pitcairn Islands in the east (130°W), exceeds 27 million km2 (Figure 1.1)iii. From a fisheries perspective, the ocean area bounded by these islands almost matches the tropical portion of the Western and Central Pacific Ocean (WCPO) defined in the Western and Central Pacific Fisheries Conventioniv. From an oceanographic viewpoint, it includes the area known as the western tropical Pacific Ocean. It comes as no surprise given this vast area that the region covered by the Pacific Island countries and territories (PICTs) is one of great geological, biological and social diversity. The region has historically been divided into three subregions in recognition of this diversity – Melanesia, Micronesia and Polynesia – based on the physical nature of the islands, biogeography, and ethnic and cultural factors (Figure 1.1). This chapter sets the scene for this book by describing the physical, biological and social diversity of the tropical Pacific; the demography of the region; the nature of local economies and limitations to economic development; and the importance of oceanic, coastal and freshwater fisheries and aquaculture to economic development and government revenue, food security and livelihoods. We briefly outline regional arrangements and plans to optimise benefits from fisheries and aquaculture, the ways in which climate change could derail these plans, and the need for a comprehensive assessment of the vulnerability of fisheries and aquaculture in the Pacific to climate change. We also describe the approach we have taken to deliver this vulnerability assessment and how the results can be used to help industry and communities adapt to maintain the benefits of fisheries and aquaculture. Figure 1.1 The exclusive economic zones of Pacific Island countries and territories. The subregions of Melanesia, Micronesia and Polynesia are also shown. and the prevailing weather conditions (Chapter 2), have supported the expansion of human settlement by providing opportunities for agriculture, fisheries, forestry and mining. The coastal waters surrounding the islands of Melanesia are relatively productive due to (1) nutrients delivered from terrestrial runoff; and (2) the occurrence of small-scale, nutrient-rich upwellings created by deflection of large-scale ocean currents around the islands. Local climate is also affected by the size of the islands in Melanesia – by intercepting the monsoons and trade winds, they generally receive much higher rainfall than the low-lying islands further to the east (see below). However, these high islands are generally subject to strong spatial variations in rainfall, with windward (usually eastern) slopes typically receiving more rain than the leeward (usually western) slopes. Papua New Guinea is so large compared to the other countries and territories it could be considered a distinct biophysical area. Both its land area and population are greater than those of all the other PICTs combined (Table 1.1 and 1.2). Mainland PNG is also the only Pacific island situated on a continental shelf, which it shares with Australia and Indonesia. The geography of PNG has a significant influence on the surrounding ocean and on the nation’s fisheries. The scale and value of PNG’s tuna industry1, the diversity of its coastal and freshwater fisheries, and the opportunities for aquaculture far exceed those of other PICTs. Figure 1.2 Guadalcanal, Solomon Islands: a typical high island in Melanesia (photo: Michael McCoy). Further eastwards and northwards of Melanesia are the countries and territories of Micronesia and Polynesia (Figure 1.1). The islands within these subregions are typically smaller than those in Melanesia (Table 1.1) and can be considered ‘atolls’ in various stages of evolution2. They range from geologically recent volcanic peaks surrounded by a narrow fringing reef, to partially subsided peaks surrounded by a lagoon, to fully evolved atolls, i.e. ring reefs formed around a completely submerged peak (Figure 1.3). Some islands have gone through more than one cycle of uplift and erosion (e.g. Nauru). Others are as large as some of the high islands of Melanesia (e.g. Pohnpei in the Federated States of Micronesia). Consequently, the islands of Micronesia and Polynesia vary greatly in the size and extent of their lagoons and their capacity to support a diverse range of habitats and resources for fisheries and aquaculture. 1.1.2 Biogeography There is a general reduction in marine biodiversity from west to east across the region, proportional to the distance from the centre of Indo-Pacific diversity in insular southeast Asia3,4. For example, the number of fish species associated with coral reefs decreases from ~ 1600 in PNG to 600 in French Polynesia5. The number of coral reef fish species used for subsistence and livelihoods also decreases from west to east6. There is also lower diversity of hard and soft corals7, seagrasses8 and mangroves9 in the eastern Pacific than in the western Pacific. The great biodiversity of the western tropical Pacific is recognised internationally and has resulted in high-level marine conservation initiatives in many of the countries in this area. These include the Coral Triangle Initiativev involving Indonesia, Malaysia, Philippines, Timor Leste, PNG and Solomon Islands, and the Micronesia Challengevi underway in the Federated States of Micronesia (FSM), Guam, Marshall Islands, CNMI and Palau. Figure 1.3 ‘Atolls’ in varying stages of evolution; (a) a geologically-recent volcanic peak surrounded by a narrow fringing reef (Rarotonga, Cook Islands) (Photo: Ewan Smith); (b) a partially subsided peak surrounded by a lagoon (Bora Bora, French Polynesia) (Photo: Jerry Lew); and (c) a ring reef around a completely submerged peak (Majuro, Marshall Islands) (Photo: Greg Vaughn). The time since first settlement declines from west to east across the region10. In PNG, human habitation is measured in tens of thousands of years, and agriculture appears to have developed there at about the same time as in the Middle East11. Towards the east, settlement is more recent. Fiji has archaeological sites dating back thousands of years and still has oral legends about the ’first landing’. Some Polynesian island cultures record their history in terms of hundreds of years. The migrations out of Polynesia were possibly due as much to the inability of smallisland ecosystems to support large human populations as they were to social causes12. Indeed, there is sporadic evidence of depletions or local extinctions of species known to be vulnerable to exploitation, such as some species of giant clams in Fiji13. * The area between the territorial/archipelagic sea boundary and 200 nautical miles from the base points. This area denotes the ‘Fisheries Zone’ where a country does not have an EEZ. 1.2 Demography Like most developing regions around the world, the populations of many Pacific Island countries and territories are increasing. In 2010, the total population of all PICTs combined was estimated to be 9.9 million people, and is projected to rise by ~ 50% to ~ 15 million in 2035 (Table 1.2). Most of the region’s population is concentrated in Melanesia, which also has higher population growth rates in general16. PNG alone accounted for 69% of the regional population in 2010 and is predicted to contribute 79% of the population growth by 2035 (Table 1.2). This overall outlook hides two important demographic trends. Firstly, some of the smallest countries and territories (Cook Islands, Nauru, Niue, Pitcairn Islands, Tokelau, Tuvalu) have experienced a population decline in recent years due to emigration. Secondly, there is rapid urbanisation throughout the region. This widespread urbanisation is a result of migration from outer islands and rural areas within larger countries to the main population centres. PNG provides a particularly potent example – urban populations there are predicted to increase by 180% by 2035, compared to a total population increase of 60%16. 1.3 Nature of local economies and limitations to economic development The economies of PICTs are diverse, but all are characterised by the advantages and constraints typical of oceanic islands, particularly the effect of geographic isolation17. Tourism plays the major role in some economies, including those of Cook Islands, Fiji, French Polynesia, Guam, CNMI and Palau. Other countries and territories in Melanesia and Nauru have derived economic benefits from forestry, agriculture and/or mineral resources. Several of the smaller island nations are heavily dependent on remittances from family members working overseas. But in almost all PICTs, fisheries play a much larger role in the economy than in most other countries1,15. Oceanic fisheries are the only natural resources that PICTs have which are not limited by the small sizes of their islands. Geographic isolation has also helped protect Pacific island fisheries from the overexploitation afflicting many stocks elsewhere in the world18. The potential to develop the tropical Pacific tuna fishery within the limits set by regional and international agreements is of great interest to several PICTs. In particular, the transfer of capacity from distant water fishing nations (DWFNs) to Pacific Island countries holds the promise of substantial, sustainable economic returns. There are, however, constraints to the onshore development of the processing facilities needed to domesticate the benefits of oceanic fisheries in the smaller countries. These constraints include limited freshwater supplies, high freight charges, relatively high wage rates compared to Southeast Asia and the limited capacity of the environment and society to absorb such large-scale operations. * Population for Pitcairn Islands not estimated (currently 66). Forest resources in Melanesia do not have the same sustainable development potential – they have long renewal times relative to current exploitation rates. Indeed, the remaining lifetime of logging industries in Solomon Islands is estimated to be less than five years19. Terrestrial mineral deposits promise to generate wealth in the region but in Nauru primary phosphate reserves have already been exhausted. On the other hand, tourism has significant economic potential. However, this potential will depend largely on the way tourists perceive the health of the marine environment. 1.3.1 Exclusive economic zones The United Nations Convention on the Law of the Sea (UNCLOS) increased the potential for economic development and government revenue for all PICTs by allowing them to declare national exclusive economic zones (EEZs) of up to 200 nautical miles from national territorial sea baselines (territorial seas extend 12 nautical miles from these baselines in most PICTs). UNCLOS provided international recognition of the vast areas over which Pacific Island states could exercise sovereign rights (Table 1.1) to exploit, manage and conserve resources found in the surrounding waters and on the ocean floor. As well as providing opportunities, sovereign rights over EEZs also carry the responsibility for conservation and management of resources. In this regard, Pacific Island countries have a long history of regional cooperation, particularly in managing shared highly migratory stocks of tuna and associated species. The Pacific Islands Forum Fisheries Agency (FFA)vii was set up in 1978 for the specific purpose of allowing the members to cooperate in the management of these highly migratory fish stocks within their EEZs (Section 1.5). The establishment of the Western and Central Pacific Fisheries Commission (WCPFC)viii in 2004 enables PICTs to cooperate with other states for the conservation and management of tuna resources and associated species in tropical Pacific high seas. The WCPFC also allows PICTs to impose an overall limit on the fishing of tuna across the entire distribution of the stocks, not just in their EEZs. UNCLOS also conveys other rights and responsibilities, including the assessment of resources. Regional cooperation in fisheries science is supported by the Fisheries, Aquaculture and Marine Environment Division (FAME) of the Secretariat of the Pacific Community (SPC), which provides PICTs with the scientific expertise and research required to understand the size and status of oceanic fisheries in the western and central Pacific. FAME also provides technical assistance for the development and management of coastal fisheries and aquaculture. Surveys of seabed minerals and the delimitation of EEZs are coordinated through the Applied Geoscience and Technology Division of SPC (SOPAC), and regional cooperation in the protection and preservation of the marine environment is coordinated by the Secretariat of the Pacific Regional Environment Programme (SPREP). vii Members of FFA are: Cook Islands, Federated States of Micronesia, Fiji, Kiribati, Marshall Islands, Nauru, Niue, Palau, Papua New Guinea, Samoa, Solomon Islands, Tokelau, Tonga, Tuvalu, Vanuatu, together with Australia and New Zealand. viii Members of WCPFC and participating territories include Australia, Canada, China, Cook Islands, European Union, Federated States of Micronesia, Fiji, France, Japan, Kiribati, Korea, Marshall Islands, Nauru, New Zealand, Niue, Palau, Papua New Guinea, Philippines, Samoa, Solomon Islands, Taiwan/ROC, Tonga, Tuvalu, United States of America and Vanuatu. 1.4 Importance of fisheries to the people of the tropical Pacific ‘Tuna fisheries are the wealth of small island nations in the Pacific; reef fisheries are their food’. These two phrases have been heard so many times over the past 20 years that they have lost their immediacy. Nevertheless, they still hold a great deal of truth even though the reality may be more complex. For example, in much of Melanesia, economic development and government revenue are based mostly on forestry or mining, and the people are more dependent on agriculture than fishing for their subsistence. This is particularly true for inland PNG20. In some small islands, tourism is the main source of income and tuna provide more local food than reef fish. But whatever the details and exceptions, many PICTs are heavily dependent on their fisheries resources for economic development, government revenue, food security and livelihoods, and are vulnerable to any change in the status of these resources. For these reasons, three main questions frame national aspirations and plans for the sustainable use of fish (1) How can oceanic (tuna) fisheries best contribute to economic development and government revenue? (2) How much fish will be needed for future food security? and (3) How many livelihoods can be based on the sustainable use of fisheries resources? 1.4.1 Economic development and government revenue The future potential for economic development and government revenue within the fisheries sector is dominated by the harvesting of oceanic fish, particularly tuna (Figure 1.4). For the purposes of this book, we use the usual broad definition of economic development as ‘an increase in the production levels of goods and services, resulting in a greater real gross domestic product (GDP)’. However, we also highlight the contribution of fisheries to government revenue, given the high proportion of such revenue derived from tuna in several PICTs1. The annual production from oceanic fisheries in PICTs, based on data for industrial fleets that target four species of tuna (skipjack, yellowfin, bigeye and albacore), is ~ 10 times greater than production derived from coastal fisheries. An accurate comparison is difficult, however, because data on production from the region’s coastal fisheries are still quite poor1 and industrial tuna catches are normally aggregated for the whole WCPO Convention area, which is larger than the region under the jurisdiction of PICTs. In 2009, the total landings of tuna in the WCPO Convention area were almost 2,468,000 tonnes (Table 1.3). The majority of the catch was skipjack tuna and most of the fish were caught by purse-seine vessels (Table 1.3). The 2009 catch from the WCPO represented 58% of total world tuna landings and, based on the average for 2005–2009, 48% of the catch in the WCPO was taken from the EEZs of PICTs. The main contribution of tuna fisheries to government revenues within the region comes from a combination of access fees paid by vessels from DWFNs, transshipping fees, export duties and taxes. The broader contribution to economic development in a number of countries comes from Pacific island-owned or joint-venture industrial fishing operations, onshore processing plants, and the employment created. These enterprises also contribute to government revenue, although many benefit from tax concessions. Access fees have historically provided the most stable of these benefits. Currently, they contribute ~ USD 80 million per year to the region1. In the case of FSM, Tuvalu, Tokelau, Nauru and Kiribati, these fees provide ~ 10–40% of annual government revenue1. Although access fees contribute less to national economies per tonne of catch than domestic fishing or processing operations, they avoid many of the risks of such investment. Nevertheless, access fees fluctuate due to market forces and the uncertainty associated with the way large-scale climate events influence the availability of tuna within different EEZs. The best-known of these climate events is the influence of the El Niño-Southern Oscillation (ENSO) on purse-seine fisheries near the equator. Under La Niña conditions, the Western Pacific Warm Pool (Warm Pool), where 80% of purse-seined tuna are caught, becomes more confined towards the west of the basin (Figure 1.5), and these fishing operations are concentrated in PNG’s waters. During El Niño episodes, the Warm Pool spreads eastwards and purse-seine catch rates in Kiribati’s EEZ increase21. Table 1.3 Total catch and estimated landed value of the four species of tuna, and main fishing methods, for the Western and Central Pacific Ocean (WCPO) Convention area in 2009. Note that 48% of the catch is estimated to have come from the EEZs of Pacific Island countries and territories (source: SPC Oceanic Fisheries Programme). Pacific island-owned fishing operations have a history of variable success. Competition with more industrialised countries, or those with lower labour, transport and infrastructure costs, is intense. Also, many Pacific island enterprises have been unable to attract private investment and have had to be financed or managed by government. Nevertheless, local operations have produced substantial economic benefits in some island nations. For example, a large percentage of the tuna unloaded from vessels fishing in the region now passes through FSM, Kiribati, Marshall Islands and Solomon Islands. Successful tuna loining and canning operations have also been established in American Samoa, Fiji, Marshall Islands, PNG and Solomon Islands1,15. Sea surface temperature (° C) Figure 1.5 Position of the Warm Pool in the western Pacific under La Niña conditions, and the convergence zone where the Warm Pool meets nutrient-enriched waters of the eastern equatorial Pacific. Tuna and their prey are most abundant in this convergence zone21,48 (source: HadISST)109. 1.4.2 Food security Food security means that all people, at all times, have physical, social and economic access to sufficient, safe and nutritious food to meet their dietary needs and preferences for an active and healthy lifeix. In the tropical Pacific, fishx is a cornerstone of food security14,22,23. The average annual consumption of fish (including shellfish) by coastal rural populations ranges from 30–118 kg per person in Melanesia, 62–115 kg in Micronesia, and 50–146 kg in Polynesia14. Even in urban centres, fish consumption usually greatly exceeds the global average of 16–18 kg per person per year14,18,24. Most of the fish used for food in the region comes from subsistence fishing in coastal waters (Figure 1.6, Table 1.4), particularly around coral reefs12,14. However, in some of the larger islands, particularly in inland PNG, freshwater fisheries (Figure 1.7) also contribute to food security. x Fish is used here in the broad sense to include fish and invertebrates. Figure 1.7 Range of freshwater and estuarine fisheries in the tropical Pacific, and the habitats that support these fisheries. to maintain current levels of fish consumption into the future, and that other sources of protein for a healthy diet will not be readily available. In other places, there are fears that overexploitation has already reduced the productivity of coastal fisheries substantially, and that it may be difficult to restore stocks to more productive levels given the high dependence on reef fish for food and livelihoods. Figure 1.8 Forecasts of population growth, and the fish needed for food security in rural ( g ) and urban ( g ) areas of Melanesia, Micronesia and Polynesia in 2030 (source: SPC). SPC’s Coastal Fisheries Programme recently surveyed fish populations associated with coral reefs in 17 PICTs. Their findings showed great variation in the productivity of sites and the status of coral reef fisheries across the region6. The challenge is to improve the management of coastal fisheries in PICTs so that they fulfill their potential to contribute to future food security14. There can be no doubt, however, that additional sources of fish are required to meet the growing need for high-quality dietary protein in the majority of PICTs. The region is fortunate that there are at least two options for increasing the supply of fish in many places. First, allocating a relatively small proportion of the rich tuna resources of the tropical Pacific for food would go a long way to filling the emerging gap between the amount of fish required for food security and the fish available from coastal fisheries. The challenge is how to distribute this proportion of the tuna resources among coastal communities and the urban poor, where it is needed most, and how to make it socioeconomically feasible for these communities to access the fish14,23,25. A second option involves progressive development of small pond aquaculture14,25, particularly in Melanesia, where the availability of fresh water and widespread acceptance of tilapia as a food fish provide the basis for such production systems. Although development of small pond aquaculture has yet to become economically sustainable in many areas, this option has longer-term potential to supply substantial quantities of fish for household nutrition. For example, culture of Nile tilapia in ponds of 450–500 m2 in Fiji can yield up to 500 kg of fish every 4–5 months, equivalent to ~ 25 tonnes per ha per year14. Small pond aquaculture also promises to provide a hedge against times when it is too rough to fish at sea, as used to be the case in several Pacific island traditions before trade goods became available26. However, for small pond aquaculture to fulfill its potential as a well-integrated, economically viable and sustainable production system, several issues need to be overcome. These include identifying appropriate species and culture methods; reducing possible effects on freshwater biodiversity; developing cost-effective feeds based on locally available ingredients; providing incentives for investment to produce and distribute fry; and training farmers14,27. economic surveys by SPC’s Coastal Fisheries Programme demonstrated that an average of 47% of coastal households, across 17 PICTs, earned their first or second income from selling the fish and shellfish they catch. These enterprises are based on (1) selling catch surplus to subsistence needs to local markets or urban centres; (2) exporting high-value invertebrates such as sea cucumber, trochus and spiny lobster, and high-value finfish such as deepwater snapper, to export markets; and (3) supplying a wide range of wildcaught fish and invertebrates to the tropical marine ornamental trade. Figure 1.9 (a) Processing tuna for export in Fiji (photo: Peter Sharples); (b) crew on a tuna longline vessel in Cook Islands (photo: Steve Beverly). Aquaculture of marine ornamental commodities (e.g. ‘live rock’, giant clams and corals) and seaweed farming (Figure 1.10) also provide opportunities to earn income in several countries. In most cases, the artisanal and small-scale fisheries and aquaculture operations do not provide full-time employment for many people. Instead, they help diversify the income earned by households. Several PICTs, particularly in Melanesia29, are looking to fisheries and aquaculture to provide more livelihoods for their rapidly growing populations. In many cases, this will be a challenge. Tuna processing plants face competition from operations in Asia, the productivity of coastal fisheries is naturally relatively low and already damaged due to overfishing in some places, and the remoteness of many PICTs limits the potential to develop competitive aquaculture operations for fresh seafood export commodities. Figure 1.10 The range of aquaculture commodities in the tropical Pacific, and the habitats that support them. 1.6 Threats to fisheries benefits from climate change The plans outlined above to optimise the benefits of fisheries for PICTs will not only have to contend with the various forces driving the sector, such as rapid population growth, market demand, fuel costs, and the need to develop an ecosystem approach, they will also have to be adapted to a changing climate. The effects of climate change on fisheries are already apparent elsewhere in the world. Here, we briefly summarise why and how the climate in the tropical Pacific is expected to change, and outline some of the likely effects on fisheries and aquaculture in the region. 1.6.1 The changing climate The build-up of greenhouse gases in the atmosphere is acting in two major ways that are ultimately expected to affect fisheries and aquaculture in the tropical Pacific. First, the accumulation of greenhouse gases is trapping more of the heat that would normally escape from the Earth, leading to an overall increase in global surface temperature32. The oceans have absorbed almost 80% of the additional heat, acting as a buffer against more rapid atmospheric warming. However, the continued uptake of this extra heat has wide-ranging implications for marine resources33 (Figure 1.11). Thermal expansion of the ocean, together with melting of land ice, is resulting in rising sea levels. Increases in ocean temperatures are also changing the strength and direction of currents, and making surface waters more stable, reducing vertical mixing and the availability of nutrients in the upper layer of the ocean. Reductions in the supply of nutrients usually limit the primary production at the base of the food chains that support fisheries. Warmer oceans also cause changes in atmospheric circulation patterns, giving rise to regional changes in climate. In the tropical Pacific, greater evaporation and moisture availability are expected, leading to an intensification of the hydrological cycle, and a poleward expansion and possible slow down of the Hadley circulation34,35. As a result, rainfall is projected to increase in tropical areas of the Pacific and decrease in subtropical areas, although there is still considerable uncertainty about the regional pattern of projected changes. There is also the possibility that warmer conditions may result in more intense cyclones and storms, resulting in rougher seas, more powerful waves and greater physical disturbance of coastal environmentsxiii. The second way that increasing greenhouse gases are expected to affect fisheries and aquaculture is through changes to oceanic concentrations of CO2 and the resulting effect on ocean acidity. The ocean has absorbed more than 30% of human CO2 emissions since the beginning of the industrial revolution and it is now more acidic than at any time during the last 800,000 years36,37. This effect is largely independent of global warming but also has grave consequences for marine ecosystems. The xiii Chapters 2 and 3 provide details on projected changes to surface climate and the physical and chemical nature of the ocean. dissolved CO2 reacts with sea water to form weak carbonic acid, which reduces the availability of dissolved carbonate required by many marine calcifying organisms to build their shells or skeletons33,38,39. There is serious concern that continued emissions of CO2 will drive sufficient gas into the sea to cause under-saturation of carbonate in some areas of the ocean this century40,41. Where this happens, the environment will favour dissolution rather than formation of carbonate shells and skeletons42,43. Figure 1.11 Generalised effects of increased greenhouse gases on oceanic and coastal ecosystems in the tropical Pacific. catches of Peruvian anchovies have varied between < 100,000 tonnes and > 13 million tonnes since 1970 as a result of changes in ENSO46,47. The different phases of the ENSO cycle also determine the distribution of skipjack tuna in the Western and Central Pacific Ocean – the fish move further east during El Niño events and further west during La Niña episodes21,48 (Section 1.4.1). Over and above normal year-to-year variations, longer-term changes in physical oceanography and biology, known as regime shifts, can have major consequences for the species composition and productivity of fisheries46,49. Some heavily fished stocks have collapsed due to the additive effects of environmental and fishing stresses50,51. However, the effects of such changes in climate have not always been negative. For example, a period of ocean warming around Greenland starting in 1925 resulted in a northern extension in the range of cod by > 1000 km and the creation of an international fishery of up to > 400,000 tonnes per year46. Questions abound for fisheries management. Will the species that currently support substantial harvests still be available as climate change continues? If not, which types of species are most likely to replace them? For those species that continue to support fisheries, will climate change reduce the capacity for replenishment and production, and increase the risk of overfishing? How should managers and policymakers respond to the projected changes to maintain sustainable benefits from fisheries? How will fishers perceive and react to the risks associated with projected changes? Will fishing at sea become more hazardous? How much will it cost to adapt? In some parts of the world, a concerted effort is being made to answer such questions. Numerous studies have documented how the observed and projected changes to the atmosphere and oceans are directly and indirectly affecting, or likely to affect, the distribution and production of fish, and the fisheries that depend on them33,45,46,52–58,xiv ­ . Other effects of climate change are also altering the patterns of fish distribution. These include (1) expansion of oceanic nutrient-poor zones65, which fish avoid in their search for food; (2) occurrence of key species of phytoplankton and zooplankton at increasingly higher latitudes66–68, which help support the food chain for oceanic fish in areas where it was previously inadequate; and (3) changes in the strength of currents, which affect the dispersal of fish larvae and consequently the areas of habitat that may or may not be replenished56. 1.6.2.2 Effects on production of fish Climate change can be expected to mediate fish production through effects on reproductive success, recruitment processes, survival and growth. These effects can occur both directly due to changes in the atmosphere and oceans and/or indirectly through the influence of climate change on the habitats that support fish46. Reproduction of fish is often highly sensitive to fluctuations in temperature56. Therefore, warming seas could have either a positive or negative effect on egg production and the timing and location of egg release, depending on whether the fish species is living where the temperature is close to its thermal optimum for reproduction. Total lifetime egg production could be enhanced if species reach maturity at a younger age and spawn over a longer period each year due to earlier onset of spawning. Egg production will be reduced where peak seasonal water temperatures inhibit species that normally reproduce year-round, and where higher temperatures cause mortality of eggs. Increases in ocean acidity can also reduce fertilisation success in some species33,69,70. The supply of juveniles available to replenish populations, varies greatly between years and locations for many species of fish and invertebrates. This variation occurs because the developing larvae have to survive a series of bottlenecks; in particular, they need to find sufficient planktonic food, encounter currents that help them reach suitable habitats, and avoid predators71–73. The great natural variation in abundance of juveniles resulting from the vagaries of larval life is projected to become even more extreme under climate change56,58,74. Interactions between the effects of higher water temperatures, ocean acidification, altered currents, changes to the depth of the mixed layer and disruptions to food webs on the production, dispersal and survival of larvae33,74–78 are expected to result in new patterns of recruitment. As a result, the areas that have the potential to yield the most fish within the distribution of a species can be expected to change. Collectively, these effects can alter the productivity of fisheries. For example, the dynamics of 12 important commercial Atlantic and Pacific fish stocks have mirrored long-term changes in air-sea temperatures and atmospheric circulation49. The direct effects on the distribution and abundance of fish, and the potential for replenishment, are not the only ways in which changes to the atmosphere and oceans will affect fisheries. Many components of climate change are expected to have strong indirect effects on the survival of coastal and freshwater fish species through modification to the habitats that they depend on for food and shelter. For example, the seagrasses and mangroves which provide nurseries for many coastal fish species would be vulnerable to increased rates of damage if storms and cyclones become more intense. Seagrasses and mangroves are also likely to be affected by changes in sedimentation from new patterns of rainfall, and rising sea levels33,79. The extent of these fish nursery areas has already been dramatically reduced worldwide through the impacts of development in the coastal zone80–82. The concern is that synergies between the effects of climate change and localised non-climate stressors will exacerbate loss of habitats54,58. Of particular concern to coastal fisheries in the tropical Pacific are the indirect effects of climate change on fisheries caused by degradation of coral reefs38,83. Survival of fish that depend on coral reefs and their associated communities for food and shelter is expected to decline as reefs become progressively degraded through the combined effects of (1) more frequent bleaching, (2) reduced capacity to grow or repair skeletons as a result of lower levels of carbonate ions in sea water, and (3) possible increased damage by more severe storms or cyclones56,58,84,85. Degraded coral reefs and populations of associated fish and invertebrates are also expected to provide fewer opportunities for aquaculture of wild-caught juveniles. Rising sea temperatures are projected to increase the risk of marine pathogens52,86,87, affecting the growth and survival of fish and invertebrates both directly and indirectly. For example, diseases are expected to have a greater impact on corals, and ultimately the coral reef habitats that support fish. The increased risk of pathogens may be particularly relevant to both small pond and marine aquaculture operations, where greater incidence of disease at high temperatures is already linked to mortality in some regions88. The effects of climate change on the growth of fish will be manifested largely through the way faster growth influences reproduction and dispersal, although production of adult fish may also improve where temperatures currently limit growth during much of the year89. However, the impact of this increased production may well be overshadowed by alterations to the species composition of catches, which are likely to occur as a result of changes to fish distribution and modification of supporting habitats. ¾¾ Availability of target species: Varying ocean temperatures or distributions of key habitats or prey species may affect the distance that fishers must travel to access commercially viable fish stocks, or the time of year that fish occupy preferred fishing grounds. ¾¾ Catchability of target species: Alterations to the depth distribution, abundance or behaviour of fish species can be expected to affect catch rates, even though the fish are still present in traditional fishing areas. Any variation in average fish size stemming from climate change will influence the selectivity of fishing gear, possibly causing changes in catchability as well. ¾¾ Proportion of non-target species: Lower-value fish species favoured by climate change may affect the productivity and profitability of industrial fishing operations through, for example, the increased time and effort needed to exclude them, and greater loss of bait. Increases in unwanted species may eventually trigger catch restrictions to limit bycatch. ¾¾ Value of fishers’ knowledge: Changes to the distribution and abundance of target species will reduce the benefits of current knowledge about fish and increase variation in catches until information on new patterns of fish behaviour and movements can be obtained. Where climate-induced changes in landings are strong and negative, economic benefits will be curtailed, food security will be diminished and livelihoods will be lost. Investment decisions are also likely to be postponed and the lower returns on labour may reduce willingness to engage in long-term stewardship of fisheries resources. ¾¾ Difficulties in developing aquaculture: Changing patterns of rainfall and more intense storms could flood aquaculture ponds more regularly in some places, and make small pond farming for food security impractical in others due to more frequent droughts18,45,90,93. There could also be higher financial risks associated with coastal aquaculture as a result of (1) greater damage to infrastructure and equipment from rising sea levels and the possibility of more severe cyclones and storms; and (2) the effects of higher water temperatures, ocean acidification, reduced salinity and increased incidence of disease on the growth and survival of shrimp, pearl oysters, seaweed and ornamental specimens90. ¾¾ Increased operating costs: Projections that cyclones and storms could possibly become progressively more intense would involve increased risk of damage to shore-based facilities and fleets for domestic tuna fishing, and processing operations. Fleets operating within the cyclone belt may need to be upgraded to provide improved safety at sea. Rising sea level may eventually make many existing wharfs and shore-based facilities unusable. Taken together, increased costs associated with repairing and relocating shore-based facilities, and addressing increased risks to occupational health and safety for fishers, may affect the profitability of domestic fishing operations. Such increased costs will need to be taken into account by PICTs when planning the optimum mix of developing local industries for tuna and providing continued access for DWFNs. 1.8 Assessing the vulnerability of fisheries and aquaculture in the tropical Pacific to climate change 1.8.1 General approach The heavy dependence of PICTs on fisheries, and the wide range of ways that fishery resources may be affected, warrants a comprehensive analysis of the vulnerability of fisheries and aquaculture in the region to climate change. The purpose of this book is to provide this assessment. To do this, we have assembled the latest information available from the tropical Pacific to determine the degree to which access to oceanic, coastal and freshwater fisheries resources, and the productivity of aquaculture, is likely to be affected by the changing climate. Our approach involves six steps (Figure 1.12). 1. Describing the observed and projected changes to atmospheric (surface) climate in the region (Chapter 2). 2. Describing the observed and projected changes to the main features of the tropical Pacific Ocean (Chapter 3). 4. Assessing the likely direct effects of projected changes to surface climate and oceanic conditions, and the indirect effects of projected changes to ecosystems on the abundance and distribution of species supporting oceanic fisheries (Chapter 8), coastal fisheries (Chapter 9), freshwater and estuarine fisheries (Chapter 10) and aquaculture (Chapter 11). 5. Identifying the economic and social implications of projected changes to the productivity of oceanic, coastal and freshwater fisheries, and aquaculture, for regional plans to use fisheries resources for economic development and government revenue, food security and livelihoods (Chapter 12). Figure 1.12 Summary of the approach used to assess the vulnerability of tropical Pacific fisheries and aquaculture to climate change. The approach is applied separately for oceanic, coastal and freshwater fisheries, and aquaculture. 1.8.2 Climate models Global climate models were used to provide the projections involved in Steps 1 and 2 of the approach outlined above. A climate model is a numerical description of our understanding of the physics, and in some cases chemistry and biology, of the ocean, atmosphere, land surface and ice regions. Climate models with reasonable ‘skill’ in capturing present and past states of the climate system are the best tools we have to make projections of what the future might hold, based on current understanding. At its most basic level, a climate model describes (1) Newton’s law that the motion of a fluid (water or air) can be determined if the forces acting on it are known (e.g. the winds pushing the surface of the ocean, or the friction trying to oppose any motion), and (2) the laws of conservation of mass and energy (e.g. if water flows into an obstacle it will be deflected, or if solar energy penetrates the ocean surface, the water will warm). In principle, we should be able to use these mathematical formulas to give a near perfect description of the real world, but in practice compromises must be made due to computational limitations. To implement these physical laws within the architecture of even the most powerful computers, our simulation of the climate system must be greatly simplified and broken down into a collection of grid ‘boxes’. For the current generation of global climate models, these boxes have a resolution in the ocean that is typically 1–2° or 100–200 km on each side (atmospheric resolutions are generally even coarser). This means that all the currents (or variations in temperature or salinity, etc.) within the area of a particular box will be represented by a single average current (temperature or salinity, etc.). Consequently, many smaller-scale processes (e.g. finer-scale circulation in coastal zones) with widths of a few kilometres are not resolved by the models. Unfortunately, these smaller scales are often the ones we are most interested in and care must be taken in ‘downscaling’ the projections from models to ensure they are useful in assessing regional impacts. To help address this limitation, many of the unresolved processes are ‘parameterised’. These parameterisations essentially translate the effect of small-scale processes to the larger scales on which the models operate. Model results presented in various chapters of this book are primarily from the Coupled Model Intercomparison Project Phase 3 (CMIP3) multi-model data set, which was used by the Fourth Intergovernmental Panel on Climate Change (IPCC) Assessment Report (AR4). All models are state-of-the-art ‘coupled’ models, meaning that ocean, atmosphere, land and ice models are coupled together, with information continuously being exchanged between these components to produce an estimate of global climate that evolves with time. These global climate models are generally run for hundreds of simulation-years subject to constant, pre-industrial (1870) forcing, i.e. constant solar energy and appropriate greenhouse gas levels (Figure 1.13). This gives the ocean time to ‘settle down’ into a near equilibrium. Using the ‘pre-industrial run’ as a baseline, the 20th century simulations incorporate increasing greenhouse gasesxv in the atmosphere in line with historical emissions and take observed natural forcing (e.g. changes in solar radiation, volcanic eruptions) into account. xv Some simulations also include sulphate aerosols and ozone. Figure 1.13 Globally averaged surface air temperature (SAT) simulated by a multimodel average of the CMIP3 coupled climate models (pre-industrial simulation – purple; 20th century simulation – black; 21st century SRES B1 scenario – blue, and SRES A2 scenario – red). The spread associated with output from different models is highlighted by the translucent shading. Also shown are observed and multi-model average changes in SAT relative to 1980–2000. Information after 1900 is based on IPCC-AR4 (Working Group 1, Figure 10.4). Inset shows the historical and future CO2 concentrations used by the models. At the end of the 20th century, projection simulations are carried out based on predefined ‘plausible’ future emission trajectories. In our case, we focus on two of these trajectories, corresponding to low (B1) and high (A2) emissions scenarios from the IPCC Special Report on Emissions Scenarios (SRES) (Section 1.8.4). Assessments are made of the ability of the models to simulate the atmosphere and ocean (for the end of the 20th century) and both near-term (2035) and long-term (2100) projections (Figure 1.13)xvi. These models are far from perfect, however, and represent only an approximation of the real world. Two different models will simulate two different climate trajectories, even when subject to the same carbon dioxide equivalent emissions, due to the use of different parameterisations and levels of approximation. The difference between models is highlighted by the spread in the projections around each of the scenarios in Figure 1.13. In general, the projected changes tend to be more certain at large spatial scales (e.g. global average temperature) but become increasingly uncertain at more local scales (e.g. the strength of a particular ocean current). To overcome some of these uncertainties, average output from a suite of xvi Since this study was designed, the IPCC has decided to use a new generation of scenario simulations based on Representative Concentration Pathways (RCPs), i.e. prescribed greenhouse gas concentration pathways throughout the 21st century, corresponding to different radiative forcing stabilisation levels by the year 2100107,108. The highest priority global model simulations will be RCP4.5 and RCP8.5, corresponding roughly to SRES B1 and A2, respectively. independent climate models is considered, rather than the outputs from individual climate models. For this book, we selected subsets of the possible 24 CMIP3 models, based on their ability to simulate present climate. By averaging across multiple models it is possible to reduce many of the biases inherent in individual models. However, systematic biases still persist in some cases, so it is important to interpret model results with an awareness of their shortcomings. The CMIP3 models only provide projections of the physical climate (Figure 1.14) and do not explicitly simulate responses of habitats and fish stocks to climate change. Such responses must be inferred from our best understanding of how productivity and higher trophic levels react to observed climate variability. For some of the analyses in this book, a number of biological components have been coupled to one of the CMIP3 models (IPSL-CM4)94 to make projections of (1) primary production and the extent of the different ecological provinces in the Pacific Ocean (Chapter 4), and (2) catches of skipjack and bigeye tuna (Chapter 8). Thus, any uncertainties associated with this model are transferred to the simulated biological responses. Sea surface temperature (° C) Figure 1.14 An example of a model output of physical climate from one of the CMIP3 models (CCSM3); in this case sea surface temperature for the A2 emissions scenario in 2035 (source: IPCC)110. 1.8.3 Assessing vulnerability – a framework Steps 3, 4 and 5 of our approach (Section 1.8.1) involve determining the vulnerability of ecosystems, fish stocks and fishing industries and communities to climate change. The IPCC has described vulnerability to climate change as ‘the degree to which a system is susceptible to, or unable to cope with, adverse effects of climate change, including climate variability and extremes’32. In this book, we have used the framework adopted by the IPCC, and several other initiatives in the fisheries sector55,95,96, to assess the vulnerability of fisheries and aquaculture in the tropical Pacific to climate change. The framework assesses vulnerability as a function of the character, magnitude and rate of climate variation to which natural and social systems are exposed, their sensitivity and their adaptive capacity (Figure 1.15). Exposure is the nature and degree to which a species, ecosystem or society is subjected to significant direct or indirect effects of a changing climate, including variations to natural extremes that exceed known stress thresholds. An example of a direct effect of climate change is the way that higher sea surface temperatures increase the frequency of coral bleaching83. An indirect effect is the way that coral reefs degraded by higher temperatures and ocean acidification provide a poorer habitat for fish85. Sensitivity is the degree to which a species, ecosystem or society is affected, either adversely or beneficially, by exposure to the direct and indirect effects of climate change. Sensitive species, ecosystems and societies are highly responsive to such effects and can be significantly affected by small changes in the magnitude and frequency of climate variables. Assessing sensitivity requires an understanding of the thresholds at which these responses begin to occur, and knowledge about whether these adjustments are likely to be gradual or ‘step changes’ and whether they are reversible. Taken together, the consequences of exposure and sensitivity result in a potential impact due to the changing climate. However, this impact can be modified by the capacity of the species, ecosystem or society to adapt to the consequences. Adaptation may be autonomous (the only option for most species) or planned (where human interventions are feasible). A planned adaptation is a strategic change in anticipation of a variation in climate. This approach to assessing vulnerability involves integrating scientific information, professional and community knowledge, and expert opinion across all the variables that affect species, ecosystems and societies directly and indirectly to highlight the risks and costs imposed by climate change. Expert opinion played an important role in the assessments presented in this book because quantitative scientific information and professional and community knowledge were often lacking. In such cases, expert judgments were used to (1) project the direction and degree of change, (2) suggest thresholds, and (3) gauge the likelihood of the projections occurring and confidence in the estimates (see Appendix 1.1 for definitions of these and other relevant terms). As a result, there are uncertainties at a variety of levels in the vulnerability assessments. First, there is uncertainty about how human society will change to address greenhouse gas emissions, and what our future emissions trajectory will be. Vulnerability Figure 1.15 Framework used for assessing vulnerability of tropical Pacific fisheries and aquaculture to climate change. Adapted from Schroter and the ATEAM Consortium (2004)106. 1.8.4 Scenarios for the tropical Pacific We deal with the uncertainties described above by basing the vulnerability assessments on scenarios. Scenarios are plausible alternative pictures of how the future might unfold. The rationale for using scenarios is not only to encompass the range of possible outcomes stemming from the uncertainties but also to alert decision-makers to potential future situations. Ultimately, governments need to be ready to adapt to all scenarios. For any scenario, they need to be able to answer the question: ‘How can we best respond if these circumstances eventuate?’ As noted above, the scenarios used in this book were based on the IPCC Special Report on Emissions Scenarios storylines B1 (low emissions) and A2 (high emissions)98 for 2035 and 2100, outlined below. B1 storyline – describes a convergent world with a global population that peaks in mid-century and declines thereafter, rapid changes in economic structures towards a service and information economy, reductions in material intensity, and the introduction of clean and resource-efficient technologies. The emphasis is on global solutions to economic, social and environmental sustainability, including improved equity, but without additional climate initiatives. A2 storyline – describes a very heterogeneous world. The underlying theme is self-reliance and preservation of local identities. Fertility patterns across regions converge very slowly, which results in a continuously increasing global population. Economic development is primarily regionally orientated, and per capita economic growth and technological change are more fragmented and slow compared to other storylines. It is important to note that the term ‘low emissions’ is used in a relative sense. Even following the B1 scenario, large changes to the climate system are projected. Indeed, the B1 trajectory is likely to result in average global surface air temperatures that exceed 2°C above pre-industrial levels in 2100, commonly defined as the boundary for ‘dangerous’ climate change. The four scenarios we use in this book (i.e. the four combinations of the B1 and A2 storylines for 2035 and 2100) were chosen to portray (1) a near-term timeframe that people can relate to easily, and longer-term projections; and (2) an optimistic scenario for greenhouse gas emissions (B1 storyline) and one that foreshadows the extent of possible impacts if the world continues to emit high concentrations of greenhouse gases (A2 storyline). It should be noted, however, that the global community is presently following an emissions trajectory that is at least as damaging as the A2 scenario, if not worse – between 2005 and 2009 an average of 2 ppm of CO2 was added to the atmosphere each yearxvii. For those interested in mid-term projections, the B1 scenario in 2100 can be used as a proxy for A2 in 2050. Note, however, that although CO2 emissions are similar, the multi-model means for some variables differ slightly in model simulations for B1 2100 and A2 2050. For example, sea surface temperature is 0.18°C (±0.23) higher under B1 2100 than under A2 2050. All four scenarios were constructed first for surface climate (Chapter 2) and oceanic conditions (Chapter 3), and then cascaded throughout the book along two pathways (Figure 1.16). This process was carried out separately for oceanic, coastal and freshwater fisheries, and aquaculture. In one pathway, the scenarios developed for Chapters 2 and 3 were used to define the direct exposure of the species/stocks supporting fisheries and aquaculture. In a second pathway, the four scenarios that resulted from the vulnerability assessments for the ecosystems underpinning fisheries and aquaculture (Chapters 4–7) were used to determine the indirect exposure of the species/stocks. Estimates of direct and indirect exposure of the species/stocks were then integrated and used in the framework (Figure 1.15) to assess the vulnerability of oceanic, coastal and freshwater fisheries, and aquaculture, under each of the four scenarios (Chapters 8–11). xvii See www.esrl.noaa.gov/gmd/ccgg/trends/#mlo_growth for the latest trends in the growth of CO2 emissions. Figure 1.16 The two pathways used to develop scenarios of the exposure of the various fisheries resources and aquaculture species in the tropical Pacific to climate change. The four scenarios that resulted from merging these two pathways for oceanic fisheries were used to assess the vulnerability of the tuna industry and identify the implications for economic development and government revenue in each PICT (Chapter 12). A similar integrated process was used to assess the vulnerability of rural and urban communities to the future availability of fish, and the implications for food security and livelihoods, based on the projected changes in production from oceanic, coastal and freshwater fisheries, and aquaculture (Chapter 12). We conclude by describing the adaptive management measures, policies and investments that governments, enterprises and communities in PICTs can use to maintain the benefits of fisheries and aquaculture. These proposed interventions are designed to reduce the vulnerability of PICTs to the effects of climate change, and help them take advantage of opportunities created by the changing climate (Chapter 13). But this book provides more than just a vulnerability assessment. Chapters 2–11 all begin with extensive descriptions of how the region’s climate, ocean, fish habitats, fisheries resources and aquaculture have functioned recently. These summaries not only provide a yardstick against which the impacts of climate change can be evaluated, they should also be useful to anyone seeking information on the significance of fisheries and aquaculture to PICTs, and the ecosystems that support these important activities. Gillett R (2009) Fisheries in the Economies of Pacific Island Countries and Territories. Pacific Studies Series, Asian Development Bank, Manila, Philippines. 2. Darwin C (1839) The Voyage of the Beagle: Charles Darwin’s Journal of Researches. Edited and Abridged Edition, Penguin Books, London, United Kingdom. 3. SPC (2008) Status Report: Nearshore and Reef Fisheries and Aquaculture. Secretariat of the Pacific Community, Noumea, New Caledonia. www.spc.int/mrd/ministers/2008/ MIN4WP03–coastal–fisheries–status–annex–a.pdf Karlson RH, Cornell HV and Hughes TP (2004) Coral communities are regionally enriched along an oceanic biodiversity gradient. Nature 429, 867–870. Green EP and Short FT (2003) World Atlas of Seagrasses. University of California Press, Berkeley, United States of America. Ellison JC (2006) How South Pacific mangroves may respond to predicted climate change and sea-level rise. In: A Gillespie and WCG Burns (eds) Climate Change in the South Pacific: Impacts and Responses in Australia, New Zealand, and Small Island States. Springer, the Netherlands, pp. 289–300. 10. Thomas FR (1999) The precontact period. In: M Rapaport (ed) The Pacific Islands: Environment and Society. BESS Press, Honolulu, United States of America, pp. 121–133. 11. Flannery TF (2002) The Future Eaters: An Ecological History of the Australasian Lands and People. Grove Press, New York, United States of America. 12. 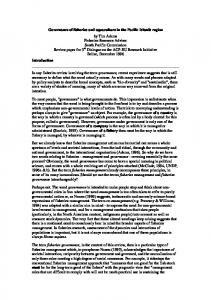 Dalzell PJ and Adams TJH (1996) Sustainability and management of reef fisheries in the Pacific Islands. Proceedings of the 8th International Coral Reef Symposium 2, 2027–2032. 13. Lewis AD, Adams TJH and Ledua E (1988) Fiji’s giant clam stocks – A review of their distribution, abundance, exploitation and management. In: JW Copland and JS Lucas (eds) Giant Clams in Asia and the Pacific. Australian Centre for International Agricultural Research, Canberra, Australia, pp. 66–72. 14. Bell JD, Kronen M, Vunisea A, Nash WJ and others (2009) Planning the use of fish for food security in the Pacific. Marine Policy 33, 64–76. 15. Gillett R and Lightfoot C (2001) The Contribution of Fisheries to the Economies of Pacific Island Countries. Asian Development Bank, Manila, Philippines. 16. SPC (2009) SPC Statistics for Development Programme (and its Pacific Regional Information System – PRISM). Secretariat of the Pacific Community, Noumea, New Caledonia. www.spc.int/prism 17. Adams TJH (1998) Coastal fisheries and marine development issues for small islands. In: MJ Williams (ed) A Roadmap for the Future for Fisheries and Conservation. International Center for Living Aquatic Resources Management Conference Proceedings 56, pp. 40–50. 20. Bourke RM, Allen MG and Salisbury JG (2000) Food Security for Papua New Guinea. Australian Centre for International Agricultural Research Proceedings 99, Canberra, Australia. 21. Lehodey P, Bertignac M, Hampton J, Lewis A and Picaut J (1997) El Niño-Southern Oscillation and tuna in the western Pacific. Nature 389, 715–718. 22. Bell J (2007) Fish – Cornerstone of future food security? Pacific Islands Business October 2007, 44. 23. SPC (2008) Fish and Food Security. Policy Brief 1/2008, Secretariat of the Pacific Community, Noumea, New Caledonia. 24. Delgado CL, Wada N, Rosegrant MW, Meijer S and Ahmed M (2003) Fish to 2020: Supply and Demand in Changing Global Markets. International Food Policy Research Institute, Washington, United States of America, and The WorldFish Center, Penang, Malaysia. 25. SPC (2007) The Future of Pacific Fisheries – Planning and Managing for Economic Growth, Food Security and Sustainable Livelihoods. 5th Conference of the Pacific Community, Apia, Samoa, 12–13 November 2007. 26. Stephen E (1936) Notes on Nauru. Oceania 7, 34–63. 27. SPC (2007) SPC Aquaculture Action Plan 2007. Secretariat of the Pacific Community, Noumea, New Caledonia. 28. Ellis F (2000) Rural Livelihoods and Diversity in Developing Countries. Oxford University Press, Oxford, United Kingdom. 30. Pacific Islands Forum Secretariat (2005) The Pacific Plan for Strengthening Regional Cooperation and Integration. Pacific Islands Forum Secretariat, Suva, Fiji. www.forumsec. org.fj/UserFiles/File/Pacific_Plan_Nov_2007_version.pdf 31. Pacific Islands Forum Secretariat (2007) Forum Communiqué. 38th Pacific Islands Forum, Nuku’alofa, Tonga, 16–17 October 2007. 32. IPCC (2007) Summary for Policymakers. In: S Solomon, D Qin, M Manning, Z Chen, M Marquis, KB Averyt, M Tignor and HL Miller (eds) Climate Change 2007: The Physical Science Basis. Contribution of Working Group I to the Fourth Assessment Report of the Intergovernmental Panel on Climate Change. Cambridge University Press, Cambridge, United Kingdom, and New York, United States of America. 33. 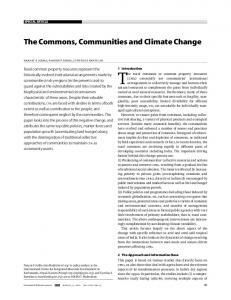 Poloczanska ES, Babcock RC, Butler A, Hobday AJ and others (2007) Climate change and Australian marine life. Oceanography and Marine Biology: An Annual Review 45, 409–480. 36. Luthi D, Floch ML, Bereiter B, Blunier T and others (2008) High-resolution carbon dioxide concentration record 650,000–800,000 years before present. Nature 435, 379–382. 37. Orr JC, Fabry VJ, Aumont O, Bopp L and others (2005) Anthropogenic ocean acidification over the twenty-first century and its impact on calcifying organisms. Nature 437, 681–686. 38. Anthony KRN, Kline DI, Diaz-Pulido G, Dove S and Hoegh-Guldberg O (2008) Ocean acidification causes bleaching and productivity loss in coral reef builders. Proceedings of the National Academy of Sciences of the USA 105, 17,442–17,446. 42. Cubillos JC, Wright SW, Nash G, De Salas MF and others (2007) Calcification morphotypes of the coccolithophorid Emiliania huxleyi in the Southern Ocean: Changes in 2001 to 2006 compared to historical data. Marine Ecology Progress Series 348, 47–54. 43. McNeil BI and Matear RJ (2008) Southern Ocean acidification: A tipping point at 450-ppm atmospheric CO2. Proceedings of the National Academy of Sciences of the USA 105, 18860–18864. 44. Brander KM (2010) Impacts of climate change on fisheries. Journal of Marine Systems 19, 389–402. 45. Cochrane K, De Young C, Soto D and Bahri T (2009) Climate Change Implications for Fisheries and Aquaculture: Overview of Current Scientific Knowledge. Food and Agriculture Organization of the United Nations Fisheries and Aquaculture Technical Paper 530, Rome, Italy. 46. Brander KM (2007) Global fish production and climate change. Proceedings of the National Academy Sciences of the USA 104, 19,709–19,714. 47. Jacobson LD, De Oliveira JAA, Barange M, Cisneros-Mata MA and others (2001) Surplus production, variability, and climate change in the great sardine and anchovy fisheries. Canadian Journal of Fisheries and Aquatic Sciences 58, 1891–1903. 48. Loukos H, Monfray P, Bopp L and Lehodey P (2003) Potential changes in skipjack tuna (Katsuwonus pelamis) habitat from a global warming scenario: Modelling approach and preliminary results. Fisheries Oceanography 12, 474–482. 49. Klyashtorin LB and Lyubushin AA (2005) Cyclic Climate Changes and Fish Productivity. VNIRO Publishing, Moscow, Russia. 50. Beamish RJ, Benson AJ, Sweeting RM and Neville CM (2004) Regimes and the history of the major fisheries off Canada’s west coast. Progress in Oceanography 60, 355–385. 51. Hobday AJ, Okey TA, Poloczanska ES, Kunz TJ and Richardson AJ (2006) Impacts of Climate Change on Australian Marine Life. Commonwealth Scientific and Industrial Research Organisation Marine and Atmospheric Research, Hobart, Australia. 52. Roessig JM, Woodley CM, Cech JJ Jr. and Hansen LJ (2004) Effects of global climate change on marine and estuarine fishes and fisheries. Reviews in Fish Biology and Fisheries 14, 251–275. 53. Perry AL, Low PJ, Ellis JR and Reynolds JD (2005) Climate change and distribution shifts in marine fishes. Science 308, 1912–1915. 54. Harley CDG, Hughes RA, Hultgren KM, Miner BG and others (2006) The impacts of climate change in coastal marine systems. Ecology Letters 9, 228–241. 55. Hobday AJ, Poloczanska ES and Matear RJ (2008) Implications of Climate Change for Australian Fisheries and Aquaculture. A Preliminary Assessment. Commonwealth Scientific and Industrial Research Organisation Marine and Atmospheric Research, Hobart, Australia. 56. Munday PL, Jones GP, Pratchett MS and Williams AJ (2008) Climate change and the future of coral reef fishes. Fish and Fisheries 9, 261–285. 57. Cheung WWL, Lam VWY, Sarmiento JL, Kearney K and others (2009) Projecting global marine biodiversity impacts under climate change scenarios. Fish and Fisheries 10, 235–251. 58. Johnson JE and Welch DJ (2010) Marine fisheries management in a changing climate: A review of vulnerability and future options. Reviews in Fisheries Science 18, 106–124. 59. Parker RO and Dixon RL (2002) Reef faunal response to warming middle US continental shelf waters. American Fisheries Society Symposium 32, 141–154. 60. Hobday AJ (2010) Ensemble analysis of the future distribution of large pelagic fishes in Australia. Progress in Oceanography 86, 291–301. 61. Welch DW, Ishida Y and Naoa-Awa K (1998) Thermal limits and ocean migrations of sockeye salmon (Onchorynchus nerka): Long-term consequences of global warming. Canadian Journal of Fisheries and Aquatic Sciences 55, 937–948. 62. Rogers-Bennett L (2007) Is climate change contributing to range reductions and localized extinctions in northern (Haliotis kamtschatkana) and flat (Haliotis walallensis) abalones? Bulletin of Marine Science 81, 283–296. 63. Dulvy NK, Rogers SI, Jennings S, Stelzenmuller V and others (2008) Climate change and deepening of the North Sea fish assemblage: A biotic indicator of warming seas. Journal of Animal Ecology 45, 1029–1039. 64. Hiddink JG and ter Hofstede R (2008) Climate induced increases in species richness of marine fishes. Global Change Biology 14, 453–460. 66. Hays GC, Richardson AJ and Robinson C (2005) Climate change and marine plankton. Trends in Ecology and Evolution 20, 337–344. 67. Richardson AJ (2008) In hot water: Zooplankton and climate change. ICES Journal of Marine Science 65, 279–295. 68. Smetacek V and Cloern JE (2008) On phytoplankton trends. Science 319, 1346–1348. 69. Havenhand JN, Buttler F-R, Thorndyke MC and Williamson JE (2008) Near-future levels of ocean acidification reduce fertilization success in a sea urchin. Current Biology 18, R651–R652. 70. Przeslawski R, Ayhong S, Byrne M, Worheides G and Hutchings P (2008) Beyond corals and fish: The effects of climate change on non coral benthic invertebrates of tropical reefs. Global Change Biology 14, 2773–2795. 71. Doherty PJ (1991) Spatial and temporal patterns in recruitment. In: PF Sale (ed) The Ecology of Fishes on Coral Reefs. Academic Press, San Diego, United States of America, pp. 261–293. 72. Sale PF (2002) Coral Reef Fishes: Dynamics and Diversity in a Complex System. Academic Press, San Diego, United States of America. 73. Leis JM (2006) Are larvae of demersal fishes plankton or nekton? Advances in Marine Biology 51, 57–141. 74. Barange M and Perry RI (2009) Physical and ecological impacts of climate change relevant to marine and inland capture fisheries and aquaculture. In: K Cochrane, C de Young, D Soto and T Bahri (eds) Climate Change Implications for Fisheries and Aquaculture: Overview of Current Scientific Knowledge. Food and Agriculture Organization of the United Nations Fisheries and Aquaculture Technical Paper 530, Rome, Italy, pp. 7–94. 75. Meekan MG, Carleton JH, McKinnon AD, Flynn K and Furnas M (2003) What determines the growth of tropical reef fish larvae in the plankton: Food or temperature? Marine Ecology Progress Series 256, 193–204. 76. Green BS and Fisher R (2004) Temperature influences swimming speed, growth and larval duration in coral reef fish larvae. Journal of Experimental Marine Biology and Ecology 299, 115–132. 77. O’Connor MI, Bruno JF and Gaines SD (2007) Temperature control of larval dispersal and the implications for marine ecology, evolution and conservation. Proceedings of the National Academy of Sciences of Sciences of the USA 104, 1266–1271. 78. Munday PL, Dixson DL, Donelson JM, Jones GP and others (2009) Ocean acidification impairs olfactory discrimination and homing ability of a marine fish. Proceedings of the National Academy of Sciences of the USA 106, 1848–1852. 79. Lovelock C and Ellison J (2007) Vulnerability of mangrove and intertidal wetlands of the Great Barrier Reef to climate change. In: JE Johnson and PA Marshall (eds) Climate Change and the Great Barrier Reef: A Vulnerability Assessment. 1st edition, Great Barrier Reef Marine Park Authority and Australian Greenhouse Office, Townsville, Australia, pp. 237–269. 80. Alongi DM (2002) Present state and future of the world’s mangrove forests. Biological Conservation 29, 331–349. 81. Duarte CM (2002) The future of seagrass meadows. Environmental Conservation 29, 192–206. 82. UNEP (2006) In the Front Line: Shoreline Protection and Other Ecosystem Services from Mangroves and Coral Reefs. United Nations Environment Programme Report, The Hague, The Netherlands. 83. Hoegh-Guldberg O, Mumby PJ, Hooten AJ, Steneck RS and others (2007) Coral reefs under rapid climate change and ocean acidification. Science 318, 1737–1742. 84. Wilson SK, Graham NAJ, Pratchett MS, Jones GP and Polunin NVC (2006) Multiple disturbances and the global degradation of coral reefs: Are reef fishes at risk or resilient? Global Change Biology 12, 2220–2234. 85. Pratchett MS, Munday PL, Wilson SK, Graham NAJ and others (2008) Effects of climateinduced coral bleaching on coral-reef fishes: Ecological and economic consequences. Oceanography and Marine Biology: An Annual Review 46, 251–296. 86. Harvell CD, Kim K, Burkholder JM, Colwell RR and others (1999) Emerging marine diseases – Climate links and anthropogenic factors. Science 285, 1505–1510. 87. Harvell CD, Mitchell CE, Ward JR, Altizer S and others (2002) Climate warming and disease risks for terrestrial and marine biota. Science 296, 2158–2162. 88. Gross MR (1998) One species with two biologies: Atlantic salmon (Salmo salar) in the wild and in aquaculture. Canadian Journal of Fisheries and Aquatic Sciences 55, 131–144. 89. Thresher R, Koslow JA, Morison AK and Smith DC (2007) Depth-mediated reversal of the effects of climate change on long-term growth rates of exploited marine fish. Proceedings of the National Academy of Sciences of the USA 104, 7461–7465. 90. Bell J, Batty M, Ganachaud A, Gehrke P and others (2009) Preliminary assessment of the effects of climate change on fisheries and aquaculture in the Pacific. In: R Gillett (ed) Fisheries in the Economies of Pacific Island Countries and Territories. Pacific Studies Series, Asian Development Bank, Manila, Philippines, pp. 451–469. 91. SPC (2008) Fisheries and Climate Change. Policy Brief 5/2008, Secretariat of the Pacific Community, Noumea, New Caledonia. 92. McClanahan T, Maina J and Pet-Soede L (2002) Effects of the 1998 coral mortality event on Kenyan coral reefs and fisheries. Ambio 31, 543–550. 95. Johnson JE and Marshall PA (2007) Climate Change and the Great Barrier Reef: A Vulnerability Assessment. 1st edition, Great Barrier Reef Marine Park Authority and Australian Greenhouse Office, Townsville, Australia. 96. Allison EH, Perry AL, Badjeck MC, Adger WN and others (2009) Vulnerability of national economies to the impacts of climate change on fisheries. Fish and Fisheries 10, 173–196. 97. IPCC (2005) Guidance Notes for Lead Authors of the IPCC Fourth Assessment Report on Addressing Uncertainties. United Nations Environment Programme and World Meteorological Organization, July 2005. 106. Schroter and the ATEAM consortium (2004). Global Change Vulnerability – Assessing the European Human-Environment System. Potsdam Institute for Climate Impact Research, Potsdam, Germany. 107. Giorgi F, Jones C and Asrar GR (2009) Addressing climate information needs at the regional level: The CORDEX framework. World Meteorological Organization Bulletin 58(3), 175–183. 108. Moss RH, Edmonds JA, Hibbard KA, Manning MR and others (2010) The next generation of scenarios for climate change research and assessment. Nature 463, 747–756. 109. HadISST (undated) www.badc.nerc.ac.uk/data/hadisst (accessed August 2009). 110. IPCC (undated) www.pcmdi.llnl.gov/ipcc/about_ipcc.php (accessed August 2009). 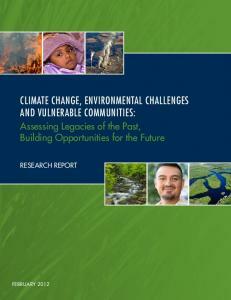 Report "Pacific communities, fisheries, aquaculture and climate change: An ..."